A yacht charter broker since 1981, Carolyn knows the industry inside and out and has personally cruised on many of the yachts she offers for charter. She uses this firsthand knowledge and experience to match your plans and wishes with the best possible charter options. As a fully informed charter broker, she travels each year visiting yachts, crews, and destinations, so she can bring you the most current information on every charter we offer. Carolyn is uniquely qualified to offer racing and performance yacht charters, as she has been a racing sailor most of her life, and never misses the Heineken Regatta in St Martin each year. Many years as a charter broker for the performance sailing yacht company Nautor’s Swan before joining NJ Yacht Charters has given her extensive expertise in performance sailing yacht charters. As a lifelong sailor, Carolyn is also on excellent terms with various charter crews. She understands what a crew needs to know about you and your personal preferences. She makes sure your crew has the details they need to give you the charter experience you want, right down to your favorite foods and what time you like to get up in the morning. Carolyn began her brokerage career at Alden Yachts in 1984, moved to Nautor’s Swan, then founded and operated Cox Marine before joining Northrop – Johnson Yacht Charters. 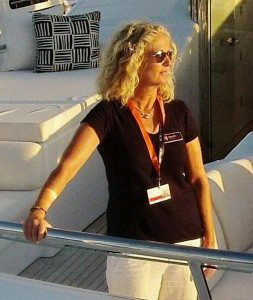 She is also a leader of the yacht charter industry, being one of the founders of the American Yacht Charter Association. She helped to establish the event that is now the Genoa Charter Show of the Mediterranean Yacht Brokers Association, an essential opportunity for international brokers to view the yachts they offer for charter. For Carolyn, your charter is not just a contract. She takes it personally, and invests in making sure every detail is attended to in advance to help assure that your charter will be the experience of a lifetime.